My tenth book, The Essentials of Business Etiquette: How to Greet, Eat, and Tweet Your Way to Success(McGraw-Hill, August 2013), reached book stores this week. It covers topics that I couldn’t have imagined discussing 18 years ago, when my first book about business etiquette was published. • 1995. Prentice Hall Complete Business Etiquette Handbook was one of the first books written on business etiquette. In this book, I discuss business letters and paper memos extensively. There is no discussion of emails, gender etiquette, or telecommuting, and only a small section on car phones and business-casual dress. • 2001. The first edition of my book When the Little Things Count…and They Always Count introduces email guidelines for the workplace. There is a small section entitled “Smart Cellular Telephone Use.” Telecommuting and gender etiquette are mentioned for the first time, as they had become areas of interest. • 2006. New Rules@Work discusses blogs for the first time, though my blog didn’t start until 2009. For most of us, social media was still in the future. • 2013. 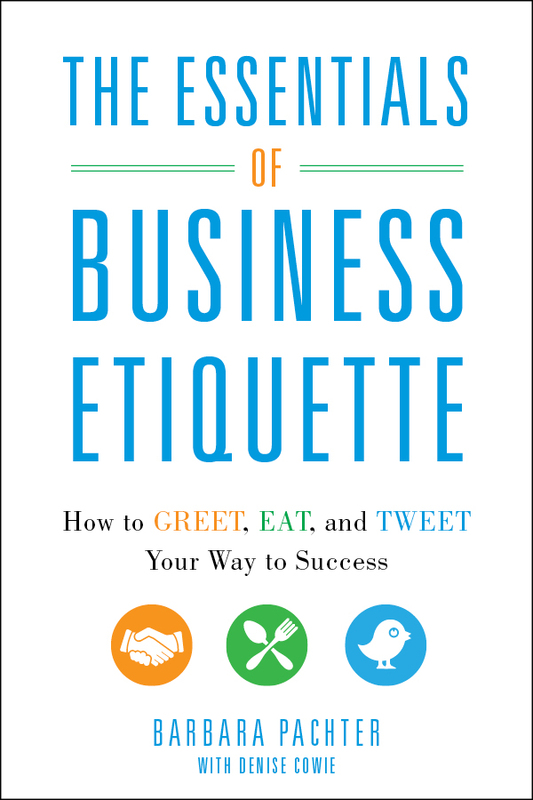 The Essentials of Business Etiquette: How to Greet, Eat, and Tweet Your Way to Success provides an in-depth look at business etiquette today, including a comprehensive discussion of social media, use of Smartphones, texting, and blogging. Plus, the book provides no-nonsense advice on how to establish rapport and make connections, project professionalism, speak and write with confidence, avoid business-meal blunders, even how to make killer presentations! How things have changed since 1995! What will be the next area of etiquette that needs addressing? Let me know what you think. You can review a sample chapter of The Essentials of Business Etiquette here. And order your copy here. Pachter & Associates provides seminars and coaching on business etiquette and communication. Contact Joyce Hoff at 856.751.6141 or joyce@pachter.com for more information. To run a smooth business, we should learn some basic tips on business, such a; market structure, customer demands, business products, goal oriented and many others. Therefore, in most of the cases, we should follow expert advice and business books. Here also, we can get a better review of "Business Etiquette". Thanks for such a wonderful book, it will definitely bring some positive changes in our thoughts. As a business owner, we should learn some basic facts about business and the first step of business is to follow the rules & regulation, business etiquette, and many other professional behaviors. From this article, we learn some extra ordinary business fundamentals. Thanks for such a wonderful article.